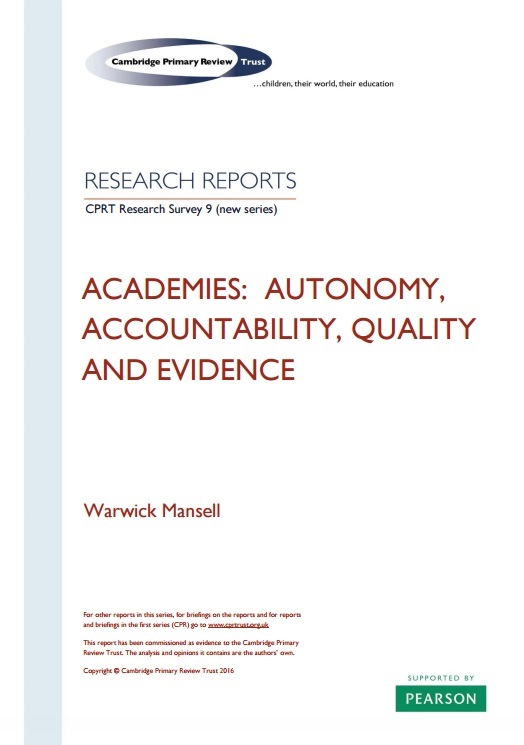 Mansell, W. (May 2016) Academies: autonomy, accountability, quality and evidence. York: Cambridge Primary Review Trust. This review will outline the main reforms in structures, funding and governance in the primary sector introduced since the publication of the Cambridge Primary Review final report: e.g. 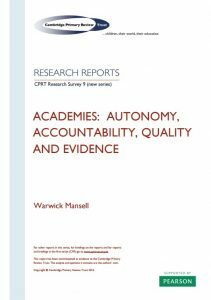 further shrinking and erosion of local control; the marketisation of schooling (academies, free schools); policies for curriculum, assessment and teacher education; teaching schools; leadership; standards; accountability and quality assurance; closing the gap, and address evidence on the impact of these. It will also consider both the policies themselves and the policy process, and make international comparisons and look at government use of international evidence (e.g. PISA, marketisation models from the USA). Children, their World, their Education, chapters 3, 13, 14, 16, 17, 20-23.